Exercise is something that is very important to me. It has not always been this way though. Prior to high school, I was very inactive and did not like to exercise or play sports. Something finally clicked my sophomore year of high school when I joined the cross country team. It ignited my passion to be active. Since then, I have exercised regularly. My favorite things to do include walking, light weight lifting, abs and running. Occasionally, I will bike, do fitness videos, etc. 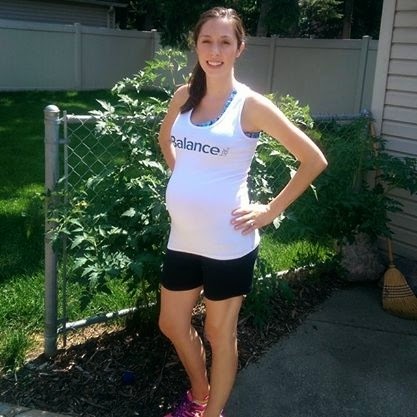 Staying active throughout my pregnancy is very important to me as well. When I first found out that I was pregnant, I was hoping to be able to maintain some kind of fitness throughout most of the pregnancy. Here I am at 38 weeks pregnant and I can proudly say that I have only missed a handful of days of exercise my entire pregnancy! Some days, it was very difficult to get out there when my body ached or I was super tired but every time that I did it anyway, I ended up feeling way better afterwards. Something about getting outside each day and experiencing nature and moving my body is so great. If I do not exercise on one day, I definitely see the difference in my mood. Walking daily each morning (and sometimes evening) has helped me feel my best and has gotten me through some of the difficult times of pregnancy. It helped me with my morning sickness and has helped my mood a ton. I read about the benefits of exercise during and after pregnancy and hope that it will help me have a shorter labor/delivery and reduce recovery time. After I have the baby, I hope to be able to get back into fitness as soon as I can. I am hoping that I can start walking again a few days after giving birth. In fact, one of the things that I most look forward to doing with my daughter is taking her on walks either in a baby carrier or stroller. I recently learned about a motivational fitness story from Erik Weihenmayer. He is the only blind adventurer to climb to the 7 highest summits in the world. Wow! He is going to kayak the Grand Canyon's Colorado River. This is a 21 day, 277 mile journey through whitewater terrain. This trip will start on 9/7. He will be supported by a paddling team and accomplished kayaker. I find this to be so inspirational because even though his blindness makes it more difficult for him to experience things, he is not limiting himself and is taking great adventures. Nature Valley is joining Erik to invite people to live a No Barriers Life. They want you to eliminate the barriers in life and live life to its fullest. I started running on the cross country team when I was a sophomore in high school too. We didn't have a girl's team yet since there was only two of us, so we were with the guys. Great fun! Inspiring post.